What does it look like when pastors cultivate a culture of generosity in the church by actively teaching and mentoring people in the spiritual act of giving? It's generosity that's contagious. A growing number of leaders are beginning to discover that there are key factors that make some churches thrive with abundant resources while others struggle with shrinking budgets. Jim Sheppard and Chris Willard have spent years consulting with church leaders across a broad spectrum of church settings and have gathered their observations into this resource, part of the Leadership Network Innovations Series. When I wrote The Blessed Life, it was my hope that Christians everywhere would be inspired to live a life of generosity. Generosity and giving are incredibly important to me. As I've followed God's principles of giving, there are many times I have found myself on the giving and receiving ends of generosity. I've experienced the "blessed life" that results from obeying God in this area, and I find it so important to communicate this truth to others that it has become my life message. As Gateway Church has grown over the last 12 years, the Lord has directed us to make generosity a core value of everything we do. We know God has called us to wisely manage our finances, as a church and as individuals so we can be the people God has called us to be. I want my congregation to be financially healthy so they can enthusiastically participate in Gods work in the kingdom. That being said, I want to emphasize that we do not pursue generosity and stewardship as a fundraising strategy for our church. Our main goal is to raise up generous stewards. The point is to give, not to get. When you understand that everything you have comes from God, you'll have no problem using your resources to build His kingdom. He will take care of the rest. Over the years, I've met many pastors who have asked me for help in this area. There are many churches that spend too much time focusing on making the budget work for their needs, not the needs of the kingdom. Many of their hearts are in the right place, but they need practical ways to grow generosity in their hearts and in the hearts of their congregation. I am thankful that Jim Sheppard and Chris Willard have collaborated to bring their shared observations to the church. Their advice, which is the result of countless hours with hundreds of churches, is not to be ignored. I loved the chapter, "Follow Me," where they show how generosity has to start with leadership. I know that in order for Gateway to be a generous church, I have to first be a generous leader. The Lord has helped my wife, Debbie, and me to be generous leaders, a standard which is now mirrored in our church. Because of this generosity, God has done and is doing incredible things through Gateway Church. I know the Lord wants to work the miracle of generosity in your church, too. Contagious Generosity will transform your thinking on biblical stewardship. Take these principles to heart as you seek to encourage and grow the people the Lord has placed under your care. Jim Sheppard is CEO and principal of Generis. He is an avid student of generosity and is passionate about spreading it throughout the church. For over 19 years, he has devoted his life to helping church people become more generous. Jim is a frequent writer on generosity and ministry funding. His articles have been featured in NACBA Ledger, Your Church, Church Business, Church Solutions, Worship Facilities and BuildingForMinistry.com. He is co-author of the upcoming book, "Contagious Generosity." He is also an inspirational speaker and he has spoken at national church related conferences including WFX (Worship Facilities), National Association of Church Business Administrators, Christian Leadership Alliance and Leadership Network. Jim and his wife Nancy have two daughters, Anna and Emily, and live in Atlanta. He is actively involved in his church where he serves as an officer and provides leadership to the Generosity Ministry Team. Chris Willard is a generosity strategist with more than 25 years of ministry leadership experience. Chris also serves as the director of generosity initiatives and premium services with Leadership Network. Over the years he has coached the leaders of some of the most effective churches in America as they have worked to accelerate generosity in their ministries. Previously, Chris was executive pastor of Discovery Church in Orlando. During his tenure there, Discovery launched three multi-site venues and experienced dramatic growth. Chris and his family continue to be actively involved at Discovery where he serves as an elder. Prior to serving with Discovery, Chris worked with Campus Crusade for Christ giving leadership to and raising funds for several strategic national and international initiatives. Chris and his wife Susan have three children, C.J., Hannah and Natalie, and live in Orlando. I firmly believe that the key to winning with money is holding it with an open hand. If you wrap your fist around your money, you may hold onto what you've got, but you won't be open to receive any more. Your whole financial life will be a series of missed opportunities to be blessed and to be a blessing. 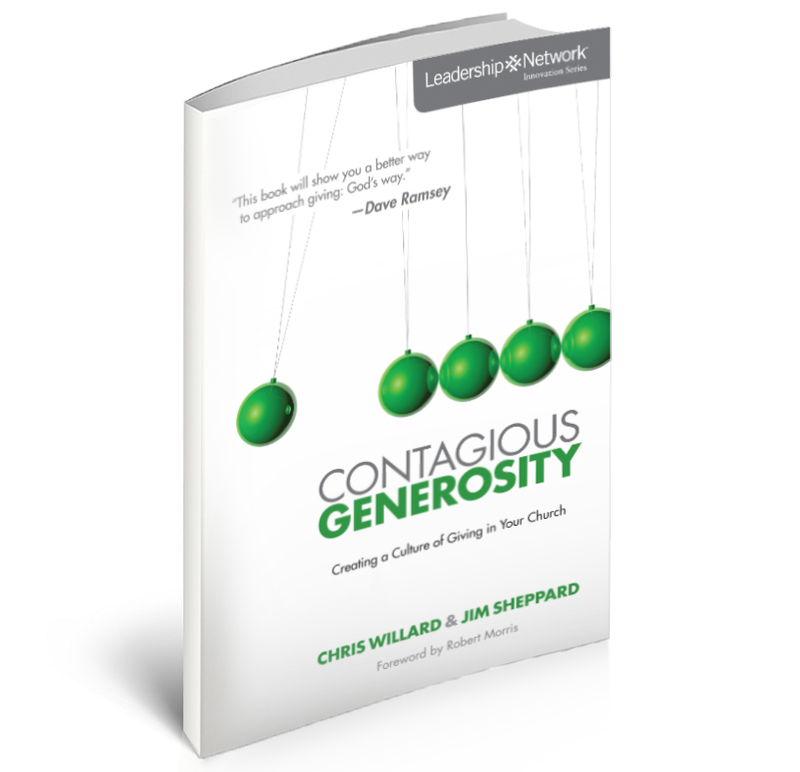 In Contagious Generosity, Jim Sheppard and Chris Willard want to show you a better way to approaching giving: God's Way. At Leadership Network we believe generosity is a key authenticator of churches to their local congregation and the unchurched community. Based on the insights of hundreds of churches and two great advisers in the area of church generosity, Contagious Generosity shows the way to translate good intention to action. Read Contagious Generosity for its dozens of uplifting stories, insights, and practical tools to get your team moving forward in this vital area. In my conversations with churches, it is clear to me that generosity is an important strategic issue. It does not happen accidentally. Chris and Jim, out of their work with hundreds of churches, have made some keen observations that will help any church become more strategic at dealing with the generosity conversation. Be prepared to be challenged and equipped! I've seen the limitations the lack of generosity places on mission and ministry. In Contagious Generosity, Chris and Jim take on the topic with boldness and wisdom. Get a team of your leaders to read this book with you and then start implementing the ideas in your church. Money is one of the toughest subjects a pastor can tackle. The problem is that too many of us prefer to ignore it and hope that the church budget will work itself out. Contagious Generosity is a much-needed alternative. It will change the way your church views money, giving, and the power of radical generosity. Contagious Generosity is a perfect and practical resource to help us all cultivate a culture of giving in our churches. Generosity unlocks hearts to be loved, opens ears to hear the gospel, and unleashes kingdom influence. Chris Willard and Jim Sheppard have included biblical how-to's for you to implement into the life of your church to increase the DNA of generosity. It's amazing what God can do with hearts that are open to giving over-and-above for others! Generosity is a mark of a healthy church and this book will help you and your church get healthy. Chris Willard and Jim Sheppard are two guys who know a lot about generosity and how it works out in the real world of discipleship and ministry. They know that it's not about money, it's about the heart. It's not about funding, it's about discipleship. This book will help you and your church create a genuine long-term culture of generosity. I encourage you to read it! In my work at Catalyst, I see church leaders take on challenges of all kinds. In our culture with its constant barrage of consumerism and "me first" mentality, moving Christ followers to higher levels of generosity is especially challenging. Chris and Jim have leveraged years of observations into a highly practical book to encourage and equip leaders to overcome this challenge. Chris Willard and Jim Sheppard provide a systematic approach for cultivating generosity in your church and helping people understand that generosity is not something that God wants from you, but something God has for you. Read and apply what is in this book and you will lead a more generous church.